Easter doesn’t just have to be about the Easter egg hunts and Easter baskets, these printable Easter candy bingo cards make for one of the best Easter games for kids! All you need is a bag full of Easter eggs filled with Easter candy, the printable bingo cards, and kids to play! My son is a bit obsessed with eggs and opening eggs. It’s actually why we quit watching YouTube a few years ago and why he gets some Hatchimals for pretty much every holiday these days. While the true meaning of Easter has nothing to do with eggs, they’re still a fun part of Easter celebrations. 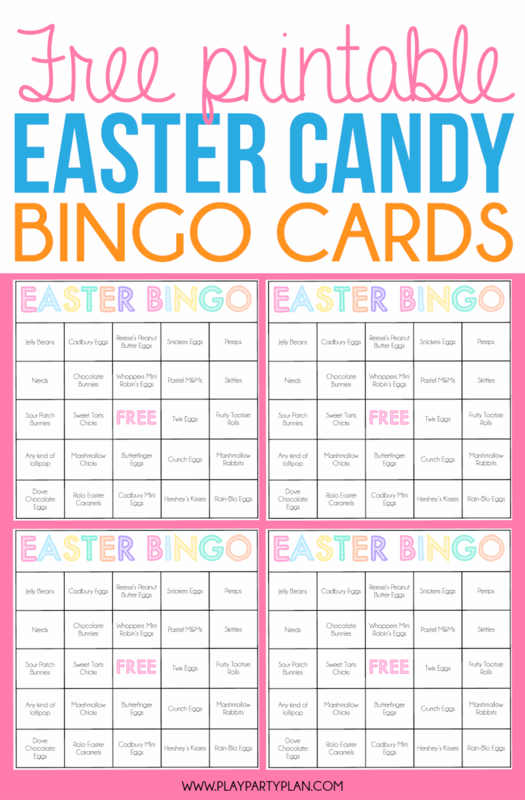 And this bingo game combines three of my family’s favorite things – Easter eggs, Easter candy, and bingo together in one of the most fun Easter games for kids. My son absolutely LOVES playing, during Easter season and throughout the rest of the year. You’ll need all of these things in order to play. 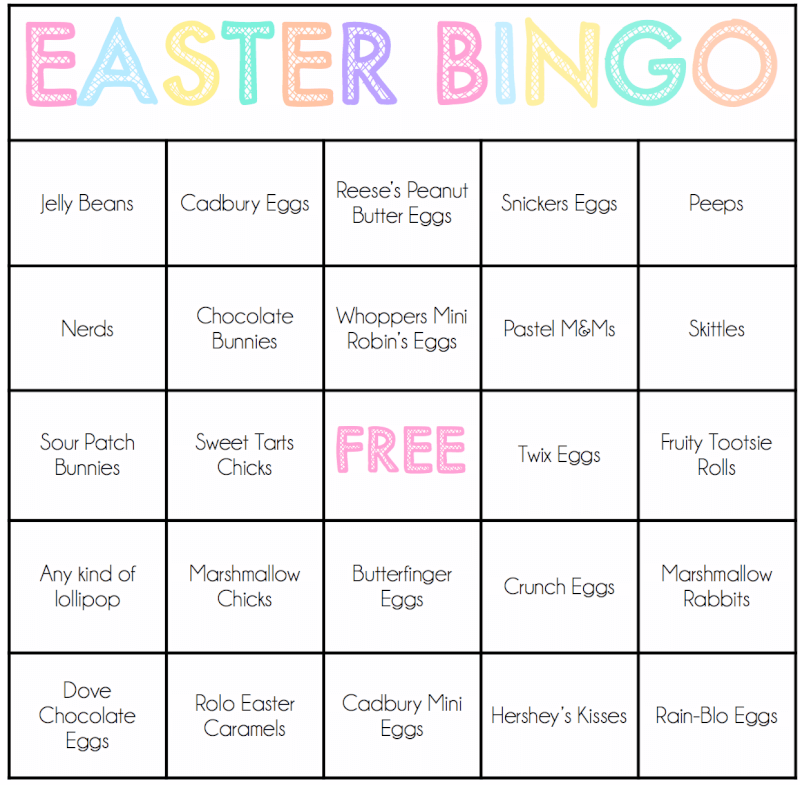 If you’d rather skip the candy version of this, try out this traditional Easter bingo game instead! Easter candies like jelly beans to be used as markers for the cards. Fill each of the empty eggs with a different type of candy from the candy list. Put all of the filled eggs in the Easter basket and set aside. Download and print out the bingo cards on white cardstock and then cut along the lines. I’ve created a set of 10 filled in bingo cards for download. If you need additional cards, download the editable bingo cards and create your own with candies from the candy list. Let everyone choose a bingo card and give them a cup or bag full of jelly beans. They can use those as bingo markers – make sure they know they don’t get a refill or they might eat them all! Once everyone has a card, choose one egg at a time to open. Or you could involve the group and have one person in the group choose an egg to open – no shaking allowed! Just pick out an egg and open. Announce the candy inside and have each player cover the corresponding space on their bingo card. The first person to get five spaces across, up and down, or diagonally gets a bingo and wins an Easter themed prize! Or you can use one of these fun non-candy Easter basket fillers! Enter your first name and email address in the form below to get the printable. If the form isn’t showing up below, click here to get to the form. I recommend printing on white card stock and/or laminating the cards so you can give them away every year! Need more fun Easter game ideas for kids? Try any of these!